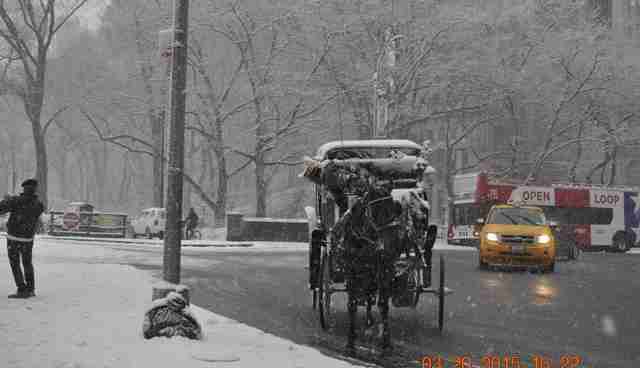 The New York City carriage trade is overseen by several city agencies representing pages and pages of regulations - but the problem has always been enforcement of those same regulations - especially the ones governing horses on the street. 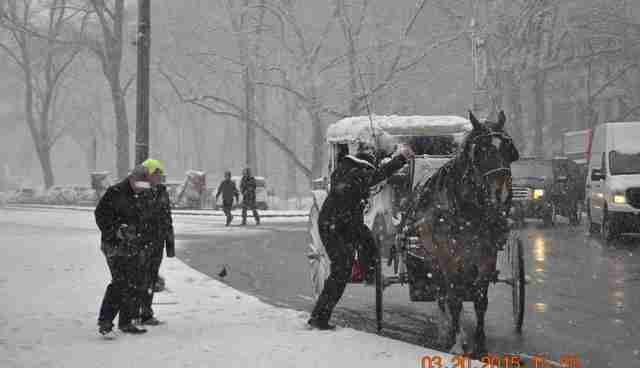 Recently, I wrote about New York City's carriage horses being worked in bad snow conditions on March 1 with little to no oversight by the City and a "suspension" that came very late because of government bureaucracy. The law states that horses are supposed to be returned to their stable during adverse weather conditions, which include snow, ice and heavy rain. It is for the horse's welfare and for public safety. The Baltimore Sun describes the dangers of horses being out in these weather conditions. 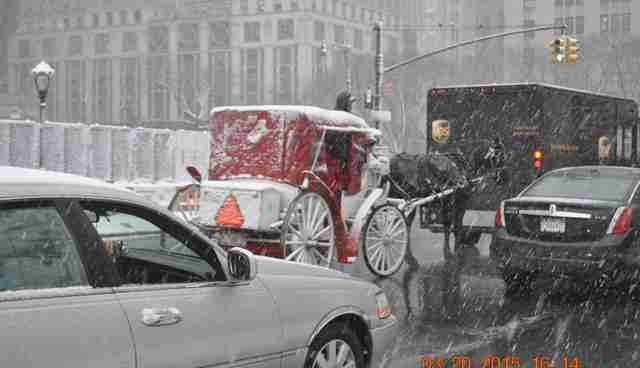 It is dangerous to work a flimsy horse carriage on the icy, slippery and congested streets of New York City during a snow storm. This is frivolous entertainment and certainly not a necessary means of transportation. It needs to stop. But just try to get the NYPD and the Department of Health to take this seriously. It seems that nothing has changed with a repeat of these conditions on Friday, March 20. 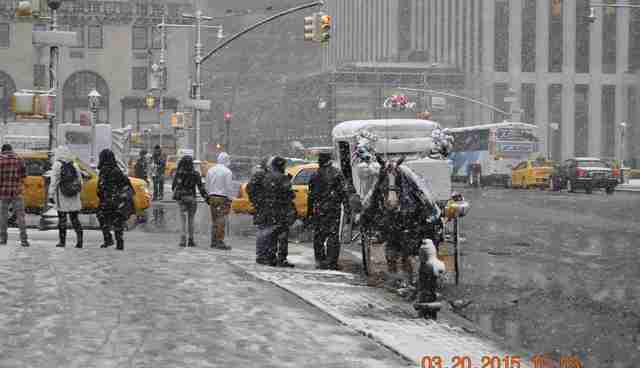 It might have been the first day of spring, but New York City was hit with more than three inches of snow. 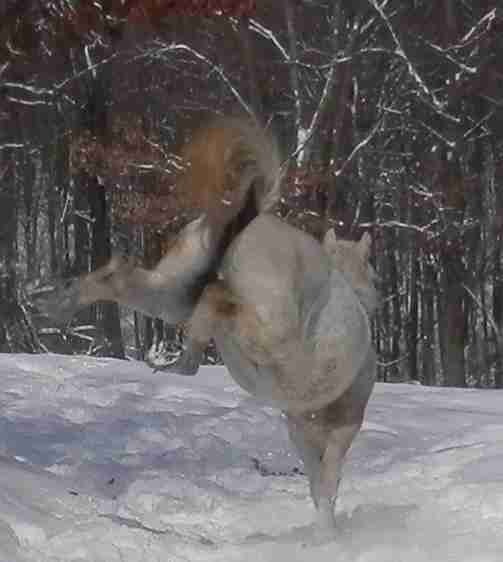 This is not about whether horses like snow or not. We know that many love it - especially when they have the freedom to make their own choice and they are not encumbered by heavy equipment and stuck between the shafts of a carriage. This is about the law - the actual law and the spirit of the law - and the lack of enforcement. This is also about travel safety. 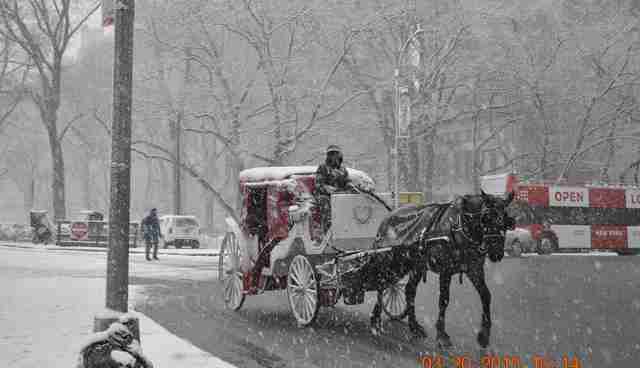 Snow covered roads make for treacherous travel for all the cars, buses, emergency vehicles in congested New York City, and particularly for the unnecessary, flimsy horse carriages led by nervous and miserable horses on slippery, icy streets. They are accidents waiting to happen. What about that does the Department of Health (DoH,) NYPD and the Administration not understand? 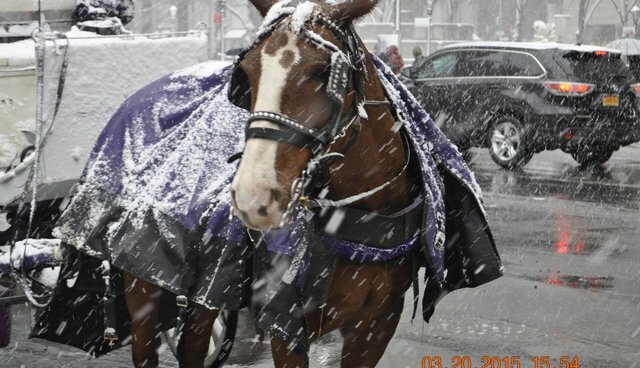 Before January 2014, the ASPCA had Humane Law Enforcement Officers on the street to monitor the horses, especially in these kinds of conditions. As the legal designee of the DoH, they were able to make an immediate determination to suspend the carriage trade due to weather conditions. What happens now is that the NYPD sends out a patrol car and makes the decision whether or not the carriage trade should be suspended. Many police officers are not even aware of this law and just assume suspensions occur only due to temperature. But because of complaints, they seem to be getting more familiar with the regulations. This,15 months after the ASPCA gave up humane law enforcement to the NYPD. However, they are not able to order the actual suspension but instead must contact the DoH with their recommendation. The DoH makes the decision to issue the suspension. Time wasted. No officer walks the hack line talking to the drivers; it is all done electronically by cell phone. On March 19, the New York City Office of Emergency Management issued a travel advisory beginning early Friday morning, March 20 through 2 a.m. Saturday. This snow storm was expected. Why doesn't the Mayor's office, DoH and the NYPD pay any attention to this? They may not care about the horses, but they should care about public safety. The DoH suspension occurred about 5 p.m., but it should have come much, much earlier. This is a business. The drivers want to make money and do not have horse welfare or public safety in mind. The law allows them to continue on with a ride that has already begun - up to a half hour - even after a suspension, but technically only applies to temperature suspensions. There is nothing in the law that allows the driver to keep his horse out during adverse weather conditions such as snow. If the weather is so bad that the carriage trade is suspended, then how is it okay to allow a driver to continue with a fare? "Owners shall not allow a horse to be worked on a public highway, path or street during adverse weather or other conditions which are a threat to the health or safety of the horse and the public. Adverse weather conditions shall include but not be restricted to snow, ice, heavy rain or other slippery conditions. A horse being worked when such conditions develop shall be returned to the stable by the most direct route as soon as practicable." That sounds to me that the driver needs to tell his passenger that the business has been suspended due to bad weather and they will not be allowed to continue the ride. How can anyone believe these drivers "love" their horses when it is so clear it is about greed. For starters, they should have returned to their stables when it began to snow, when the conditions were not dangerous - knowing that it was only going to get worse. Instead, they wait for the official suspension, which, because of the bureaucracy, is delayed. Why does it always take horse advocates to monitor and document these situations? These are some of the pictures we took. We caught five carriages still on the streets. Come on, Mr. Mayor. This situation is worse for the carriage horses than it was when you took office, which coincided with the ASPCA giving up humane law enforcement. You promised to shut down this industry. What happened? Do something! This has gone on long enough. You can help. If you live in New York City, contact your council member: If you have not contacted your Council Member yet to support Intro 573, the bill to ban horse-drawn carriages in New York City, do so now. Call them. E-mails get deleted. 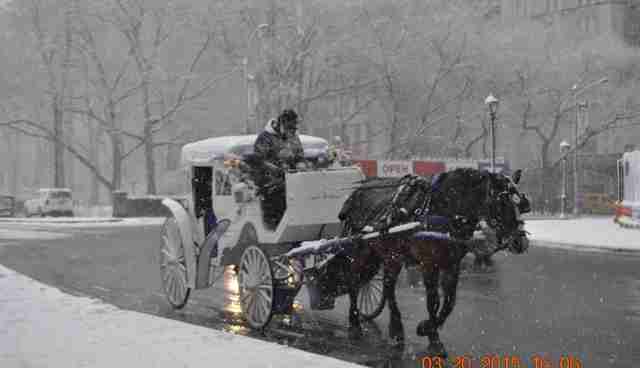 Many are not aware of the constant disrespect for the law displayed by the carriage drivers who profess to "love their horses." Send them this article. You may find your council member by clicking here. If you live outside New York City, please contact members of the Transportation Committee.